A few nights back I stayed up late, reading this interview with “journalist” Janet Malcolm. 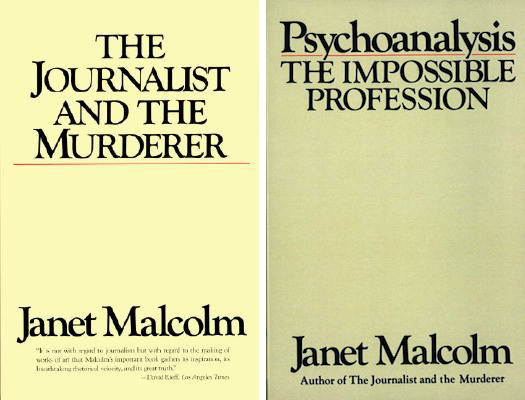 I put quotes around the term because Malcolm famously wrote The Journalist & the Murder, a kind of meta-book which takes as its subject the relationship between murderer Jeffrey MacDonald and author Joe McGinniss, who wrote a best-selling crime thriller about MacDonald called Fatal Vision. Malcolm’s book was one in which the journalist doesn’t come off much better than the murderer. One can only imagine she thinks of herself as something apart from this particular breed of human. But if journalists are murderers — and let’s assume to be a murderer is undesirable — what, then, does Malcolm think should journalists become? Psychologists, perhaps? Hmmm. She may deny psychology’s influence but I would dare even an armchair psychologist to not detect a strong thread of self-hatred and horror in Malcolm’s descriptions of writers & writing. She discusses the “brutal frankness” of an early writing teacher. The purpose of journalism? “Malice remains its animating impulse.” Even her much-adored deceased husband, Gardner Botsford, is not immune to accusations of cruelty. She recalls a writer edited by Botsford who referred to him as “The Ripper.” Not content to let blame lay in one direction, she goes on to explain the writer was particularly fond, probably too fond, of their own words, blaming their self-regard as much as Botsford’s ungentle hand. I don’t know whether journalists are more agressive and malicious than people in other professions. We are certainly not a “helping profession.” If we help anyone, it is ourselves, to what our subjects don’t realize they are letting us take. I am hardly the first writer to have noticed the not-niceness of journalists. Tocqueville wrote about the despicableness of American journalists in Democracy in America. What one forgets amidst all of Malcolm’s fulminating about the motivations of the journalistic exercise is that there are sometimes subjects worth eviscerating. Not, perhaps, in the daily, all-encompassing and self-absorbed fashion that has defined the internet age thanks to the practices of publications like Gawker; but, yes, in a wry subliminal sort of way, the character assassinating power of a journalist can be a force for good. 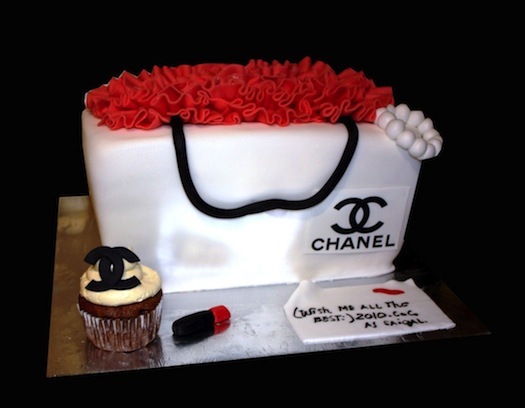 Read for example “Brand New Bag,” a recent piece from The New Yorker about the simultaneous aesthetic fall and economic rise of the Chanel brand under the watch of designer Reed Krafoff. Was his influence benign or malignant? Let this image serve as a preview. After Coach bags had become ubiquitous in the closest of well-heeled women in the Northeast and the Midwest, Cahn sold his business to the Sara Lee Corporation and, in 1985, went off to make goat cheese at his new venture, Coach Farm, in upstate New York. To succeed him, Cahn chose Lew Frankfort, a Bronx native… Frankfort raised sales from nineteen million dollars to half a billion during his first decade in charge. Dontcha love it when subtext is laid out in bold type? And that was just the tip of the iceberg. The article consistently used the ironic commentary of those around Krakoff to turn the normally fawning profile genre against its subject. It was less a paean than a roast. Now, personally, I’m no hater of Krakoff. Frankly I’d never heard of the guy before reading the piece. But I was convinced of the necessity of journalism like this. Was there real harm done here? Possibly. But what’s not to like about using an individual case study in fashion to point toward a larger decline in the Western Civilization? i.e. The way utility is reduced to consumerism; classics are replaced by trinkets; et. al. To return to Malcolm’s framework, the inheritor of the Chanel brand, Krakoff, is in a sense murdered by his father, the brand founder Miles Cahn. And while that’s not exactly a classic Oedipal complex, I’m pretty sure there’s some psychological inversion of the concept that covers what’s going on here. What I’m certain about is that there’s no moral framework which defends the creation of monstrosities like this.